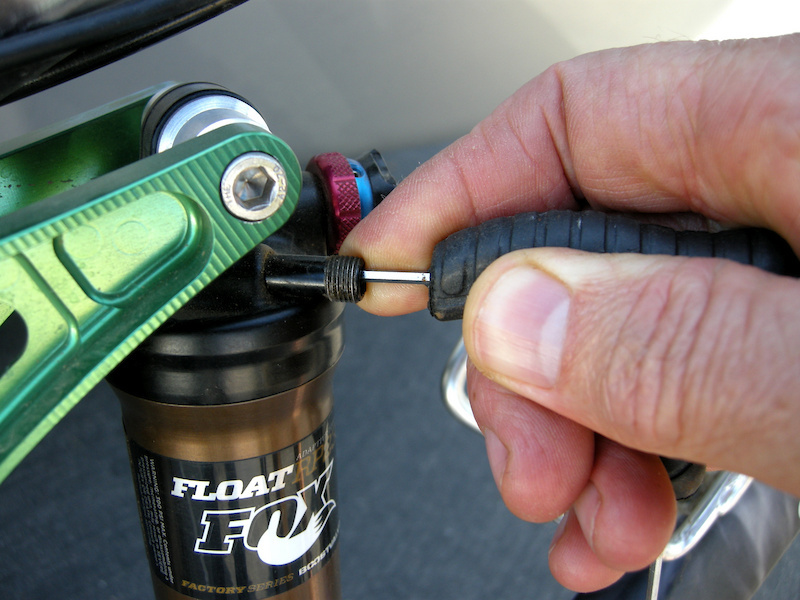 Change the spring rate of the Fox Float RP air shock in three minutes with the new Float Volume Spacer kit.Change the spring rate of the Fox Float RP air shock in three minutes with the new Float Volume Spacer kit. Air-sprung shocks can be tuned to work with a relatively wide range of rider weights. 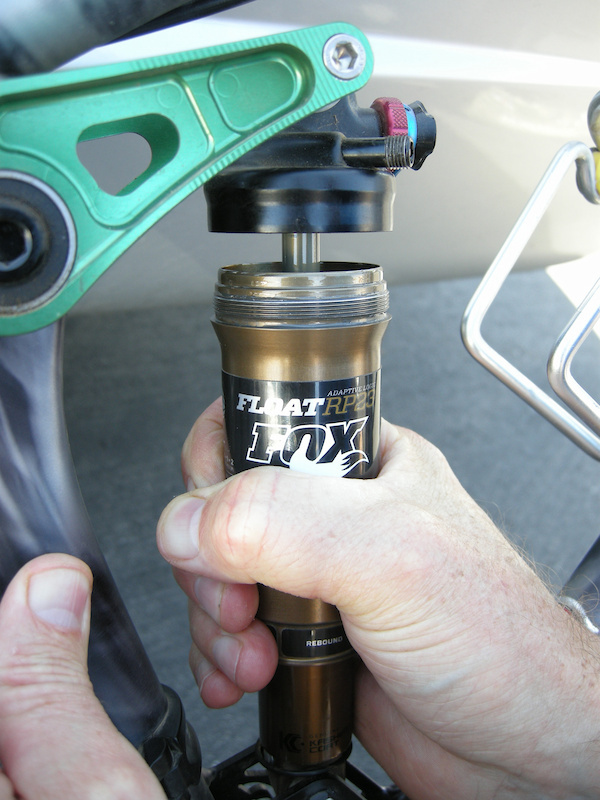 That said; there are instances when an air spring cannot be satisfactorily tuned because a rider is too heavy for a particular suspension design, would like to use less air pressure without bottoming the suspension, or may want the shock to perform outside of the limitations imposed by the volume of its stock air canister. 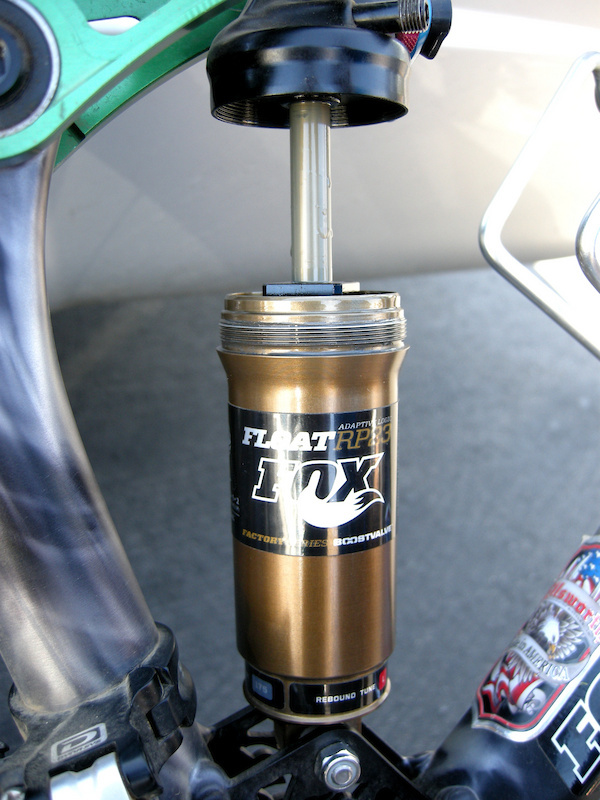 The Fox Float Volume Spacer kit allows you to tune your air-shock's spring rate inexpensively and without tools. Before we show you how to install a volume spacer into an RP 23 shock, we'll go over the spacer kit and cover a few tuning tips so we all start on the same page. Taking a cue from aftermarket suspension tuners, Fox Racing Shox developed an internal Volume Spacer kit for its RP-series shocks that changes the compression ratio of the air spring. 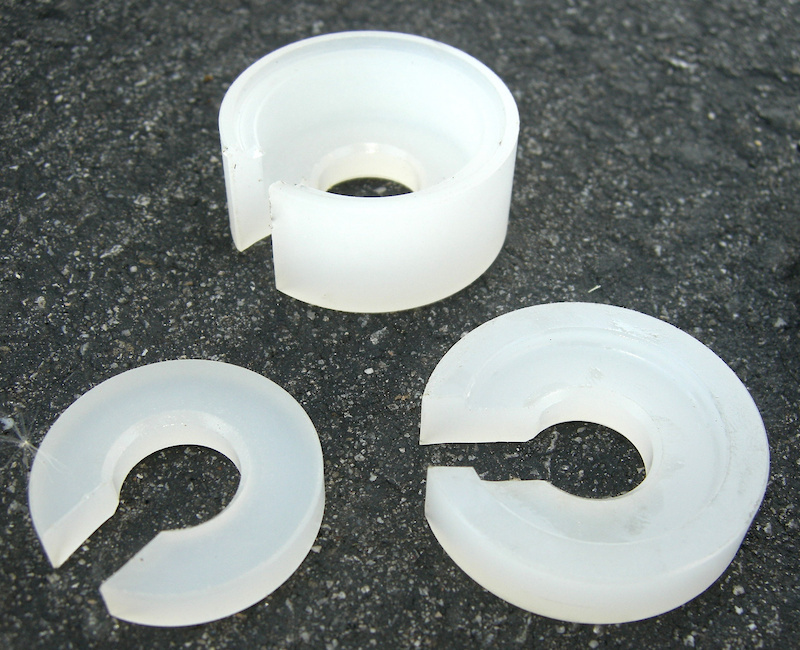 The kit includes three plastic spacers that snap onto the shaft inside the air canister. The spacers reduce the air volume of the air-spring chamber, causing the pressure to ramp up faster as the shock compresses. In case you wanted to know, the volume changes for each spacer are, .2, .4 and .6 cubic inches, and installation can be done with a shock pump and a small screwdriver in three minutes. Fox Volume Spacer kit includes .2, .4 and .6 cubic inch plastic spacers that snap inside the RP23 shock's air-spring chamber. 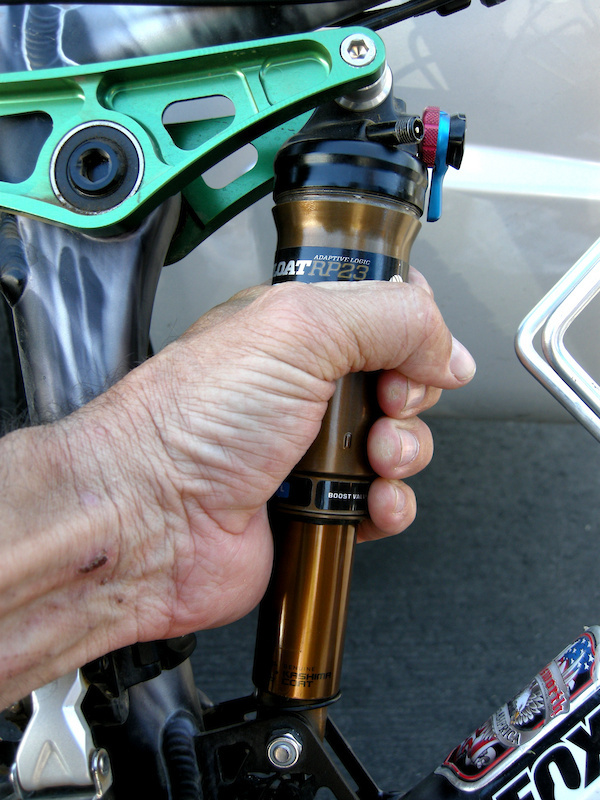 Fox Racing Shox developed the air-sprung Float RP 23 and its near relatives to be the most versatile shock made. The debut of its volume spacer kit gives rank-and-file riders an inexpensive tuning tool that previously was a professional-only option. Why Change the Shock’s Compression Ratio? 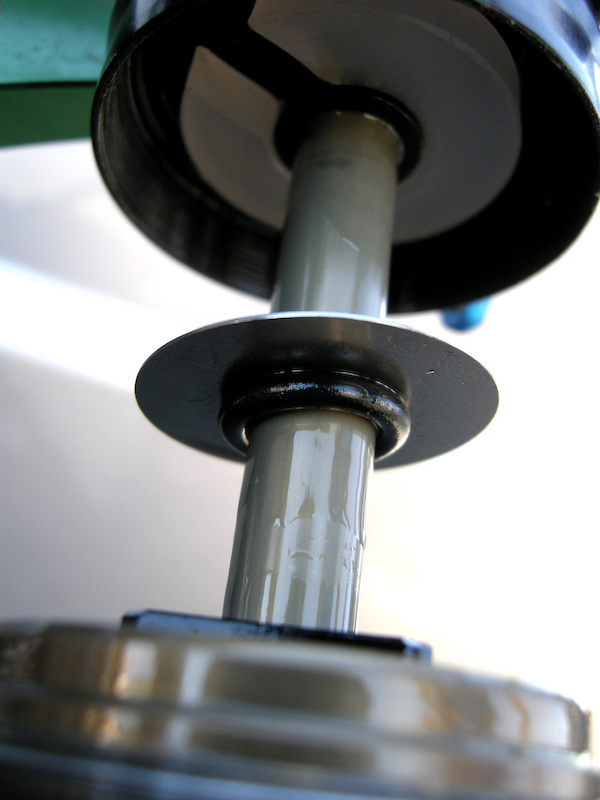 Before we get started, a brush-up on air springs and spring rates may be helpful. Unlike a coil spring, which retains zero energy while uncompressed, an air spring begins at a high, pre-set static pressure. Preload adjustments to change suspension sag do not affect a coil spring’s overall rate, but any changes in air pressure will alter an air shock’s suspension-sag measurement and its overall spring rate at full compression. Because sag and spring rate are bound together, a rider who pumps an extra 50 psi into the air can in order to prevent harsh bottoming must also suffer a harsh ride in the initial suspension travel and a taller ride height due to reduced shock sag. 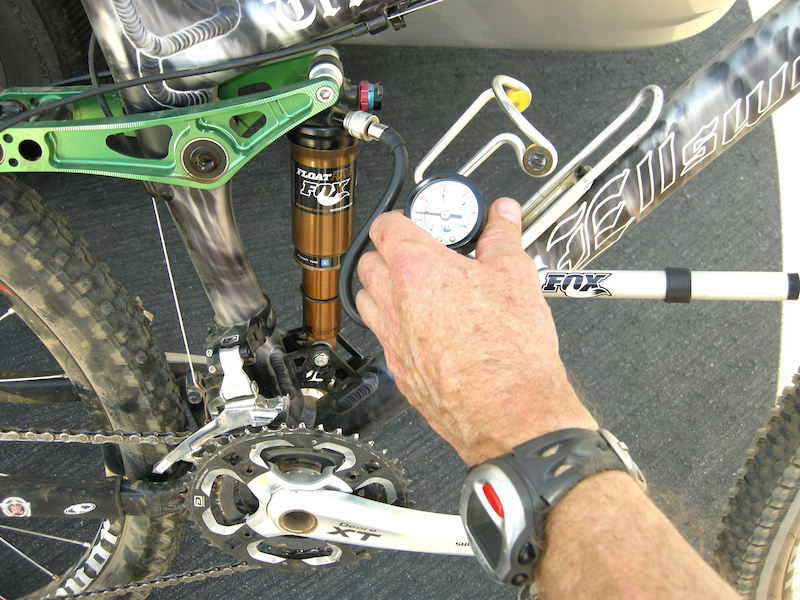 Suspension tuners separate the sag and spring-rate functions of an air shock by changing the volume of its air can. Reducing the volume of the air chamber causes the air pressure to ramp up quickly, so the spring pressure can be set low, allowing more suspension sag without risking harsh bottoming. A larger-volume air can ramps up less at full compression, but the shock will sag less because more volume requires significantly higher starting pressures to prevent bottoming at full compression. Fox’s internal spacers allow riders to change the volume of the air spring and fine-tune the spring rate of the shock without replacing the expensive air can, or even removing the shock from the bike. Read on and Pinkbike will show you how it's done. 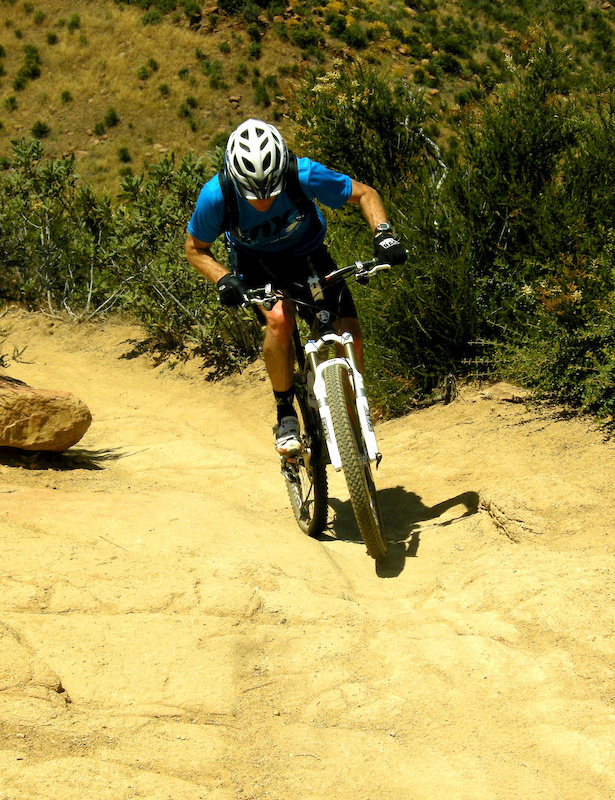 Jim (Master of Stone) Noonan powers up "the Staircase" on Chumash Trail. Jim came down from the Fox factory in Watsonville, California, to talk 2012 suspension, ride bikes and show us the new Volume Spacer kit. Fox’s Jim Noonan visited Pinkbike to give us the blow-by-blow on their new air-volume spacer kit. Jim says the whole process can be done by hand, with no tools beyond a shock pump. To prove how simple a task it is, we installed the spacers in the trailhead parking lot. That said, he recommends that the work be done in your home environment because it is imperative that no dirt or grit be introduced into the inside of the shock. Step one: Release all pressure from the shock. Depressing the Schrader valve with a small Allen Key or screwdriver makes this easy. Step two: The Air Can is threaded to the top of the shock body. Grab it firmly and twist it clockwise (right to left) to unscrew it. 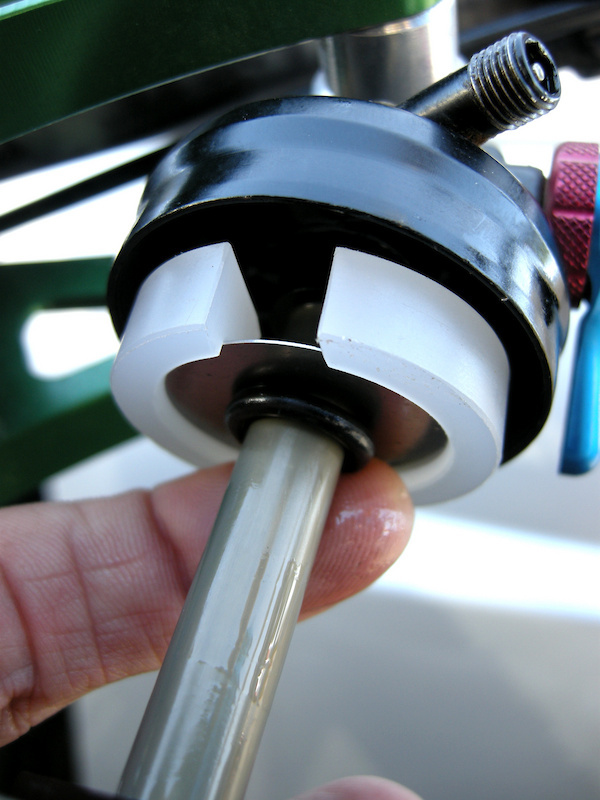 The force of the shock's negative spring will keep the can pushed up against the threads. It is important not to yank down on the can at this moment. Step three: Carefully slide the air can down the shock body. As the lower seal of the air can reaches the end of the shock, the negative spring will abruptly switch off. Stop right before the can's air-seal slips off the shock and the can will remain in place. Check to see that the can will stay put before you release it. Step six: Grab the air can securely with one or two hands and ease it back upwards until it GENTLY rests against the threads of the air can head and then screw it in counter-clockwise (Left to right) until it tightens snugly with moderate hand pressure. Take care on this step not to lose control of the can when the negative spring engages because the sudden acceleration will slam the can into the threads of the sealing head and can damage the shock. Step seven: Inflate the shock to your normal pressure first. Take the bike out for a short test run to establish a base-line setting before you begin experimenting on new shock-spring pressures. OK, that’s all there is to it. Contact Fox Racing Shox to learn more suspension setup tips in its uber-informative tech section. If you have any Fox air-spring tips to share, we’d love to hear from you. Visit Parktool.com to see their entire lineup of tools and lubes. I 'uill buy Fabiaun Bahrels siGnatuhr shim staQ' !!! I uill' put it' to my all-montaGne bisiClett so I cann out-pedalle' any DauHille' uankehr in D' baik Pahrk'! mohaha! RS as well - I mean just listen to the sound of that: "Sam Hills signature shim stack set for your Boxxer and Vivid"
WAKI: I think the same. Take a look at many dh forums. Everyone knows what they must say about parts to be cool, even if they hadn't ever seen them. "About Me: I love dj and xc. i wish i had something along the lines of a Specialized SX." Um, you're saying you wish you weren't a real man? I just came up with a new idea for shim stacks. They should sell anodized ones!!! Sam Hills signature stack should have shims in rainbow colours! A limited World Champs edition FTW! Endless customization for real men yiiiiihaaaaaaaaaa! Ah yes, then I get it! $24.99 for 3 plastic shims? Really? When a fork travel spacer is $1.99 and a full Float rebuild kit is less than $10? I hope they at least come with a rebuild kit. Want to reduce the air volume by 5 cc's? Follow the above steps but just dump 5 cc's of float fluid in the can. Really? The extra fluid is all it needs to get the same result? well it makes sense. the fluid is incompressible and takes up that much volume in the canister, just like the shim does... but it just seems pretty ghetto. But a piece of plastic is not ghetto? You can make your own shims, a mate of mine used a bit of plastic bottle IIRC. That just seemed like a total bodge though so I never tried it! Anyone know if the shim kit fits older (2009) RP23s or just the new ones? Thats how you define ghetto! I had great success cutting up a mouse matt for a shim. I think it was 18mm deep and went round the circumference of the inner air can. The gripper side of the matt was used externally and it held itself in place, ran it for three years, no problems. just a tip for anyone that's reading, NEVER take the shock apart while it's on the bike like this article shows, if some air has slipped into the wrong chamber, the air can can shoot off pretty quickly, and obviously if the shock is still on the bike, it could cause some damage. Instead remove it and tie a rag through the eye of the shock so that if the air can does shoot off, it has something soft to stop it flying off and becoming damaged. As a professional mechanic, I concur. It's not all that safe. Put it in a vice for removal with a rag wrapped around it. Have you guys seen this happen? Surely the dust seal will be stopped by the shock bolt before the air seal comes off the end of the grey/Kashima shaft? well that's the point, it could damage the air can itself is what i meant, rather than anything else. I've only serviced an air shock myself once, so i've not seen it happen, but it does. I service these things all the time, so I do want to hear from somone that knows if a stuck-down shock will go POP!! when it is still mounted on the bike. There is no POP until the air seal comes of the end of the grey/Kashima shaft and I think the shock bolt/mount would stop it getting that far. And if the shock is stuck down, it takes quite a bit of effort to slide the outer sleeve off the end (the burped air resists it). I'm two weeks and a 30+ hour flight from doing the experiment myself. Caution is part of any suspension repair. The Volume Spacer installation is quite easy and one that Fox believes can be done by any competent home mechanic. I learned it just by watching Jim Noonan run through it. I just installed the medium spacer (.4). I did it as part of putting in new seals - the whole thing is a piece of cake. Now I can't wait to feel the ride and then change spacers if need be. People seem to put it down, but it is a precision made piece and fits perfect. Well worth the 25 I'd say - plus it's only 8 bucks for a seal kit - makes a new custom ride for under 35! I think this is a great product, and if you can get a better ride out of it it is worth the dosh. I would suggest that one works with a mechanically/suspension savvy friend who will change the spacers for you. You ride a piece of trail with a mind on the quality of the rear suspension. The friend changes stuff WITHOUT TELLING YOU WHAT HE DID and then you ride the trail again and give feedback on the difference. And if I was doing that for you, I would tell you that on one of the 'pit stops' I am not going to change anything at all, and you have to figure out when it happens. I did this with my DHX-air but instead I just used a glob of cheap bearing grease and packed it into the same area that the spacer goes (in this tutorial). It's works well because you can just scoop out or add more grease to fine tune the spring curve. Bearing grease will stay thick under reasonble heat so it won't move once the shock warms up. I could realy use this for my DHX 5.0 air. do they do one for this model. when fitted on my single pivot dh frame, the huge amount of leverage (because its a single pivot) makes it compress and bottom out real easily. i'm pretty sure this would help. just do the do them for the DHX !! Is just me, or one od this steps (2 or 6) is wrong ?? Hey guys i need your help, i tried bleeding my hayes stroker trail brakes , i have tried 6 times but every time it has weak pressure, and i know its because of air in the line , but how can i prevent the air from getting in the line. Any tips ?? please help me out here. I have a high volume air can on my shock. After releasing the air, do I have to remove the high volume canister or is it possibile to simply grip the can on the lower parts, where the high volume air canister is not, and open it that way? Thanks for any help in advance. As a working bike mechanic who rebuilds these things on a more or less daily basis I can say some of the users concerns about breaking or damaging the air can seem unfounded. Comments like, "it's never happened to me before, but it does happen" should be your red flag right there. Anyway, just make sure you clean everything up good (you don't want any of the dirt caked on your bike falling off into the shock) and empty out the shock's air pressure thoroughly (as stated in the above instructions) before attempting to unscrew the can. I have rebuilt dozens of these shocks and have never had problems with air pressure 'magically' remaining in the air shock after depressing the schrader valve for a good ten seconds. Then again it only takes a minute to take the shock off of most bikes, so just do whatever you are more comfortable with. If it's been a season of riding since your shock was last overhauled it's time for new seals and float fluid anyway. nice tuning option. thanks for the article. I had the same problem with the stock large volume RP23 on my El Guapo. I like about 35% sag. At this pressure, the shock was reasonably plush but bottomed way too easily. In my case, changing to a small volume can resolved the issue. That was more expensive than a plastic spacer. can someone answer the question please: can this be used with all older model float shocks? Do they disassemble the say way? I have an float R off of an 07 Reign that would benefit from this. Thank you! So who fancies moulding a couple of these out for a couple of quid? yes they do work with late model floats! Did this today for my large canned Trance X. Night and day difference in performance, for the better that is. Stupidly easy, but my air can would stay down, so i had to hold it while i put the spacer in. Meh. agreed! i read it and it seems fairly simple. besides, i only weigh 150 lbs with my gear on. i don't even need this thing, LOL! 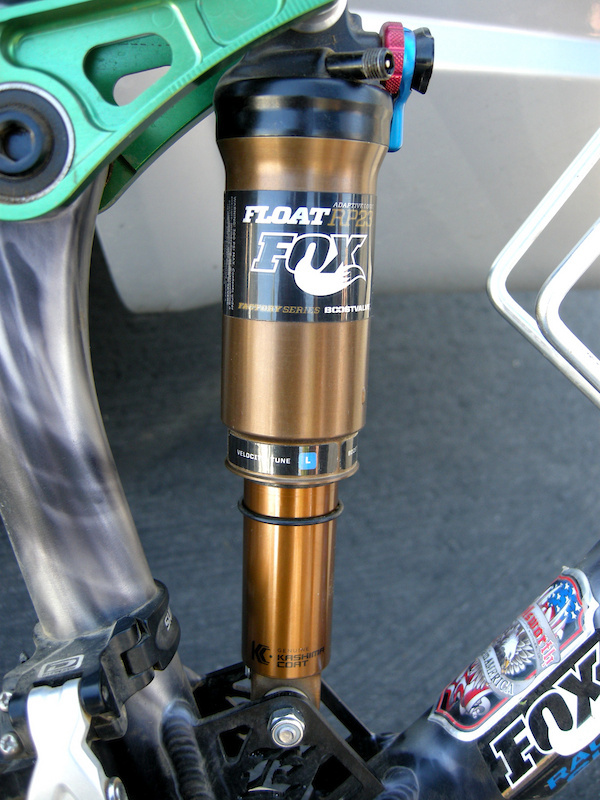 Will this work with all previous Fox Float shocks or only the newer models? so if i set my psi to 200 to get 20% sag this will let me set lower psi to get same sag???? where do i get one in Toronto? No, the volume spacer should not have an effect on your sag. If you put one in you should be able to ride with the same pressure as befor. The volume spacer only makes your shock more progressive, so you will need more force to botton it out. It basicly affects the last third of a shocks travel. interesting, this is the first time I see a rear shock with Kashima coating. Must be really special to have one of those. Nope nothing too special its just next years float they'll be available to the public by mid july. Please do a: How to service a Boxxer! Thanks for this one. I just did it for the first time on my Float Evo CTD as the spacer it comes with is not quite enough. Definitely a little pricey, but then it says fox on it so what do you expect? just got some delivered, no more bottoming out for me! so what does this actually do? I think the product is a wonderful idea. People can change damping with any shock or fork through valving shim stacks/orifice oil flow, but you CAN'T change the spring curve unless you actually change the air volume of an air shock. There are a lot of high volume air cans out there, now, and I'm not sure that people know what high/low air volume does. A higher volume is more linear can may feel more "efficient". However, if you have a high spring rate for bottoming, the initial rate will be pretty high(efficient). A lower air volume will provide a "cushier" ride with a a bigger ramp up so you can have a high spring rate for bottoming, and a lower initial rate for small bump compliance. People have been putting plastic in their high volume cans on older Trek Remedy's to fix the small bump compliance issue. Regular volume cans are expensive, but this is a cheaper and cleaner alternative. That's a pretty sweet paint job. Will these fit on the new ctd floar too? did i miss the video or what? A video wouldn't have been necessary at all. But the last tech Tuesday was how to screw a screw in your rear mech if you cable snaps. I could have said that in one sentence. But they still made a video for that.